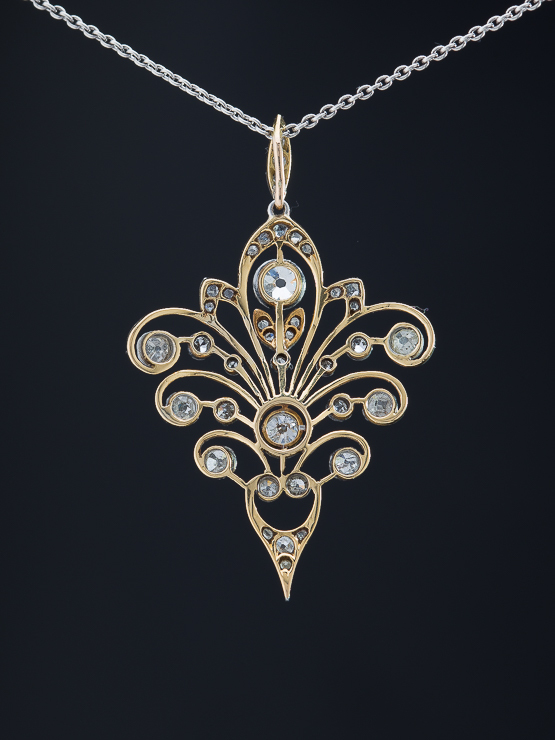 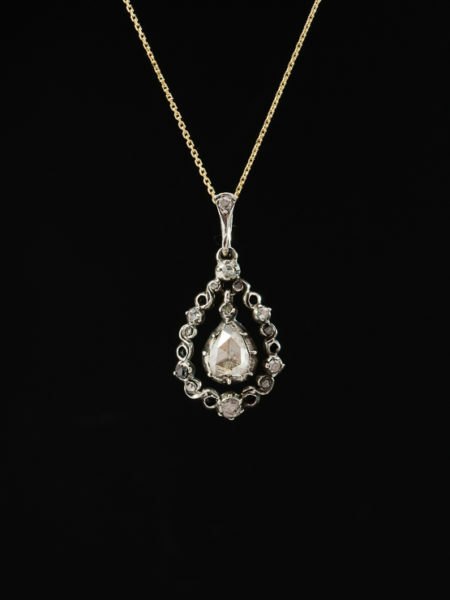 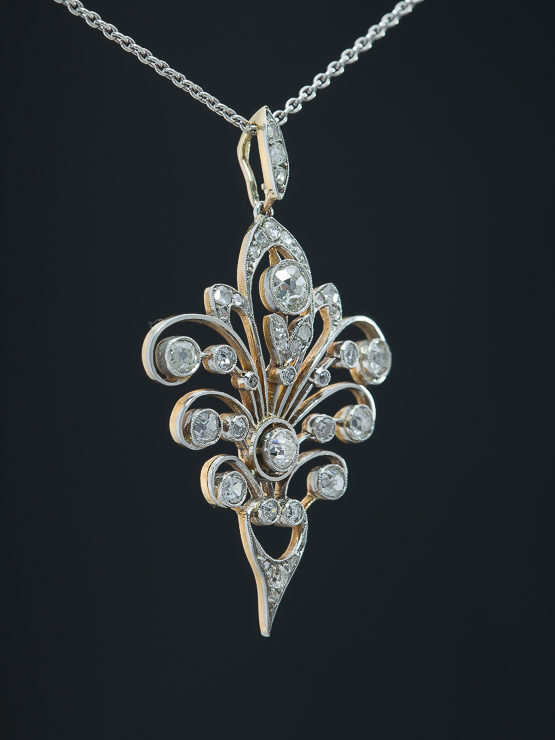 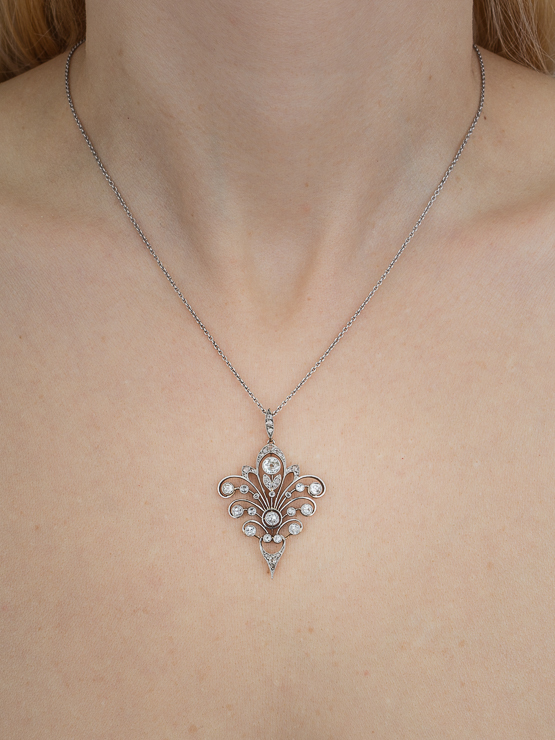 Delicacy, sophistication, sensuality and flawless design create a diamond Edwardian pendant of note. 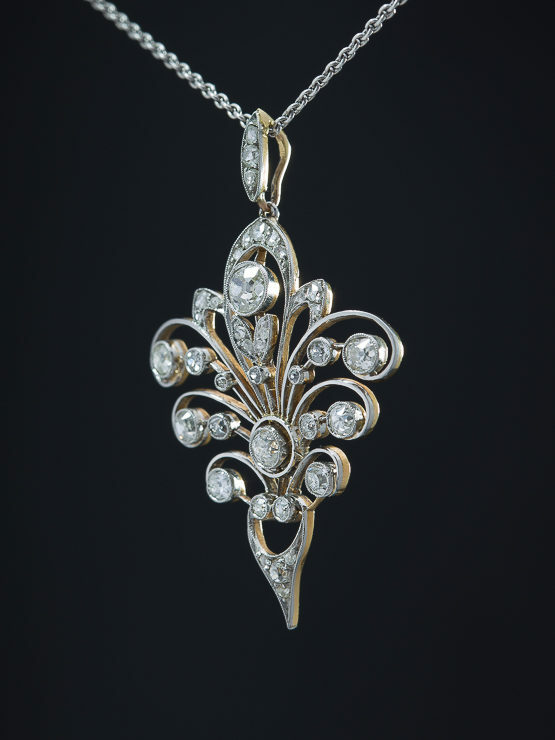 Understated grandeur is clearly apparent in this 2.04 Ct diamond pendant from Edwardian era. 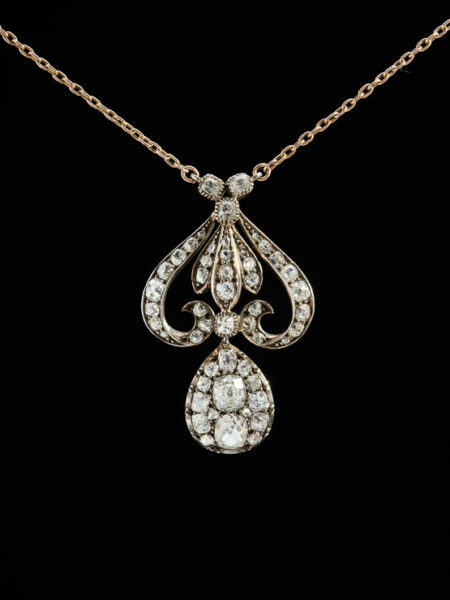 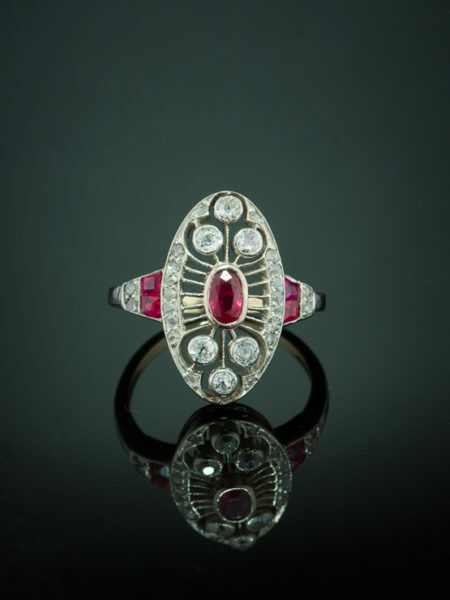 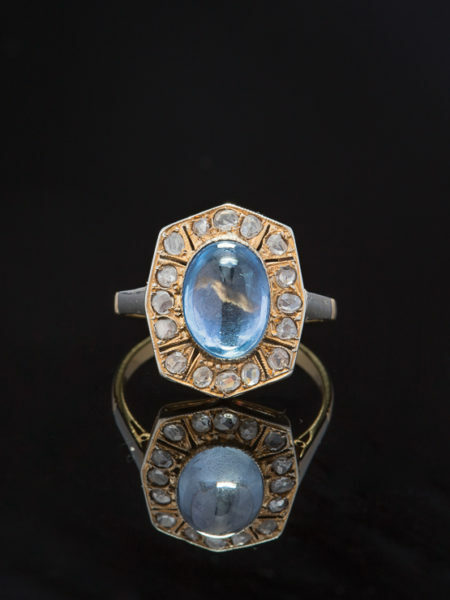 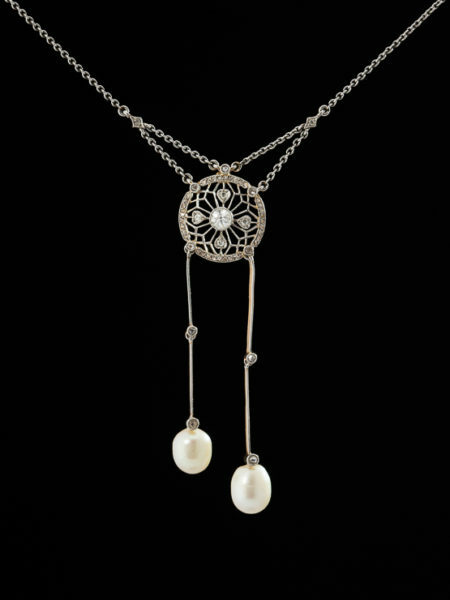 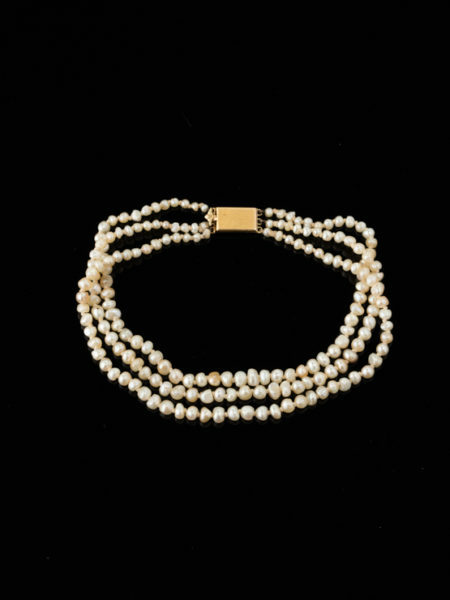 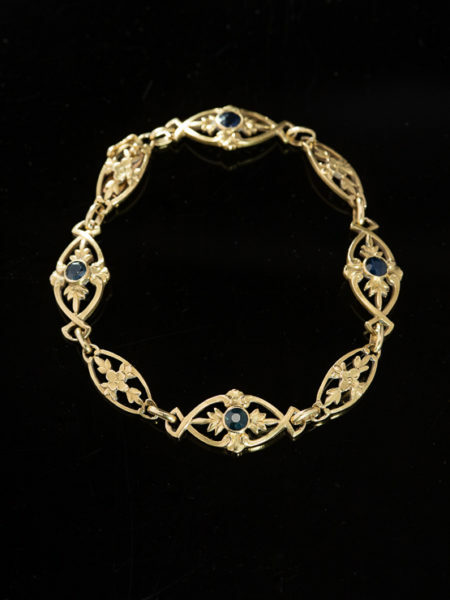 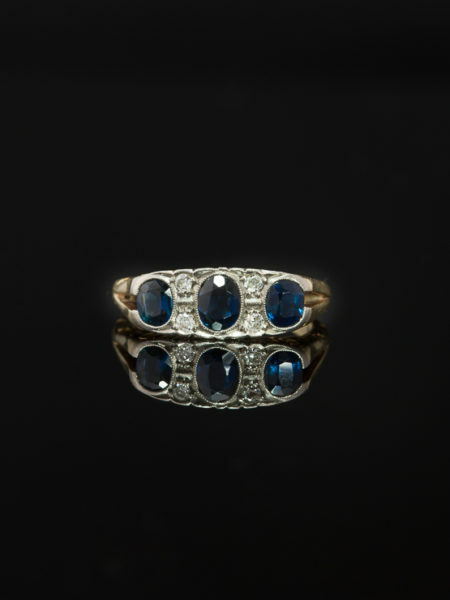 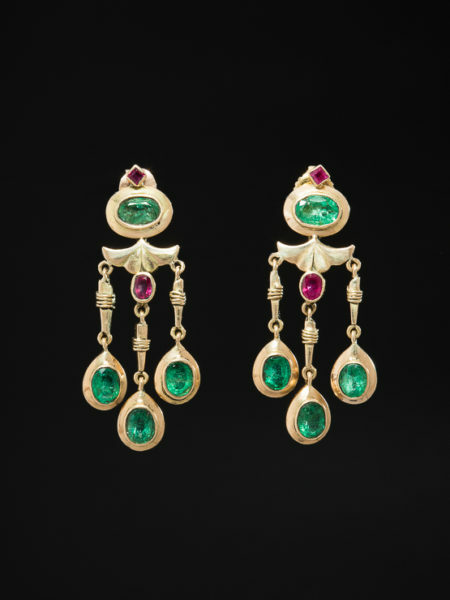 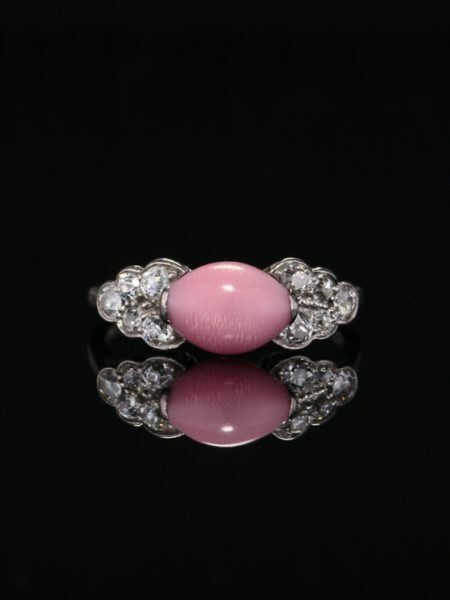 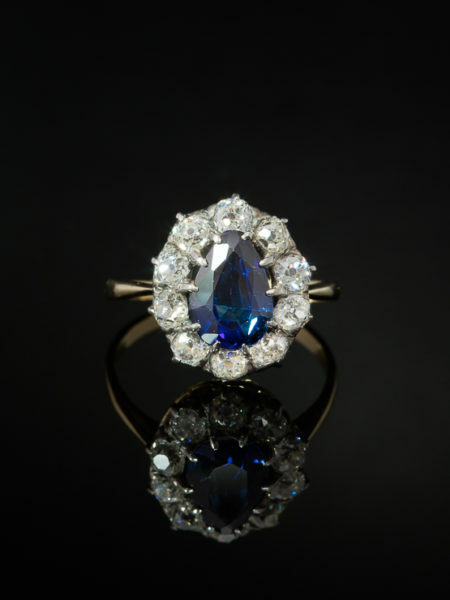 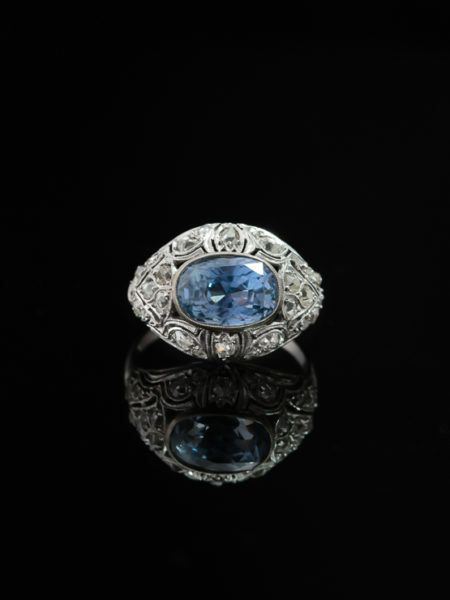 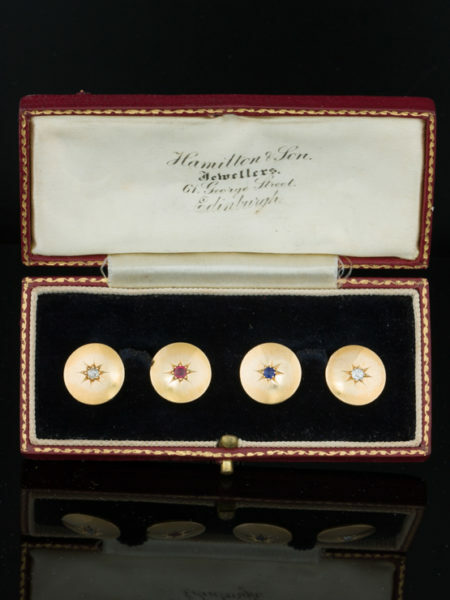 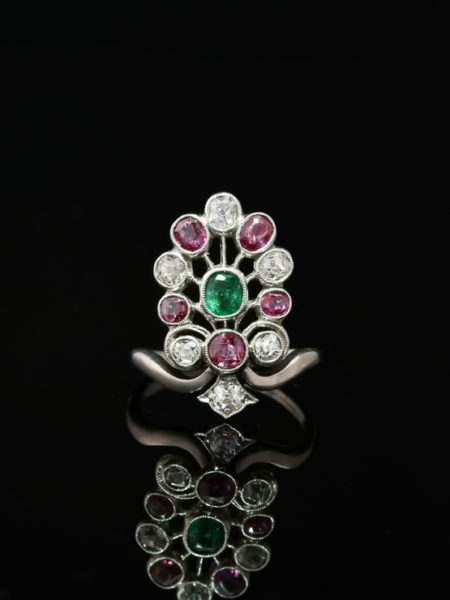 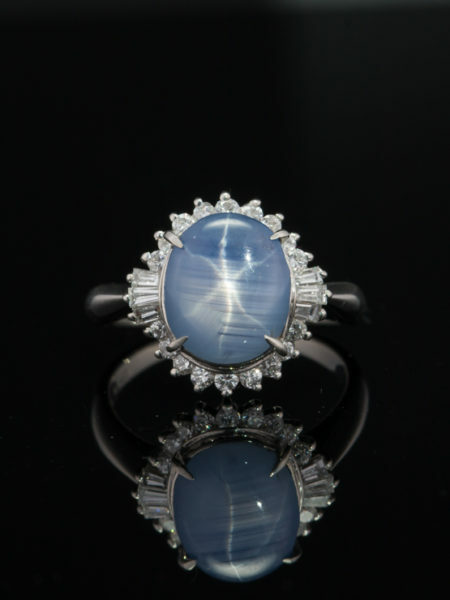 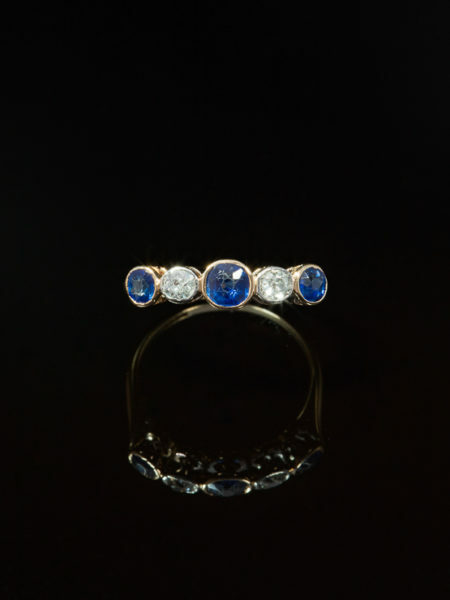 Jewelry from this period took on a graceful, light and elegant appearance. 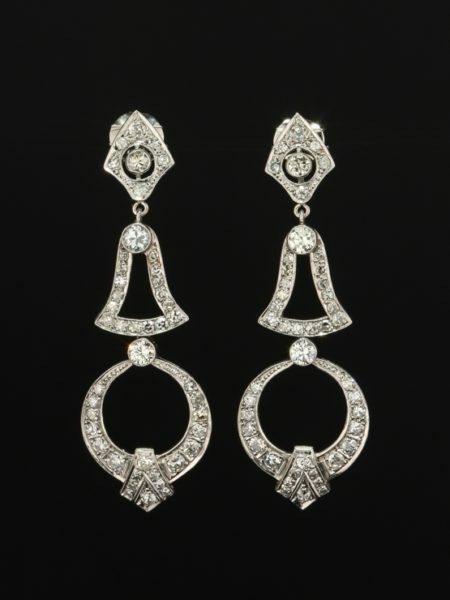 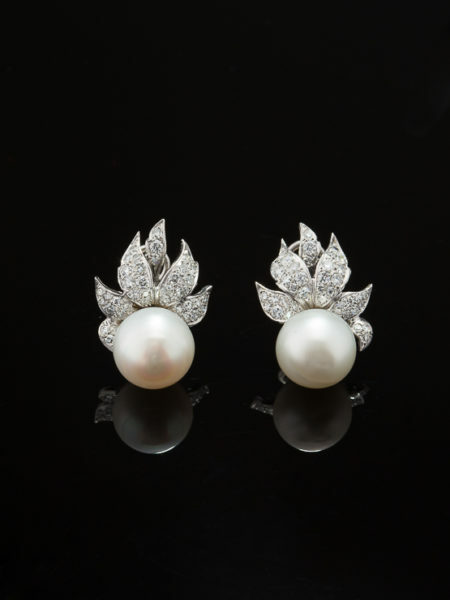 Femininity and delicacy were the trademark design elements. 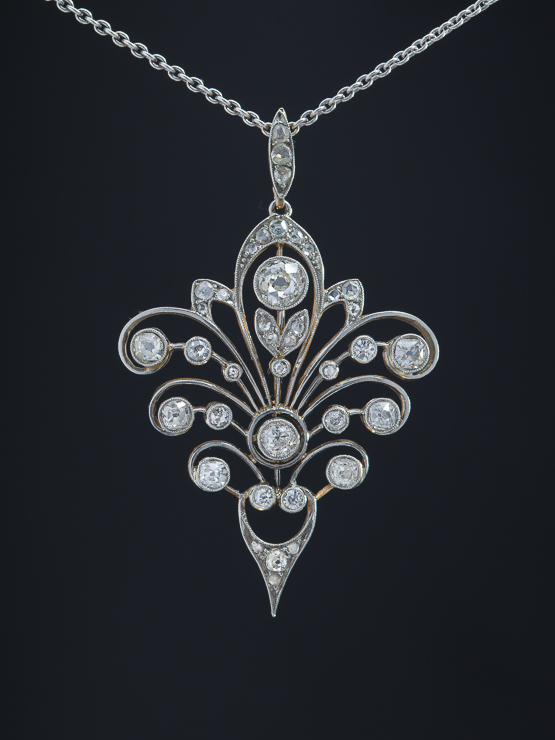 A sensual open work rendering of a flower motif allows for leaf shapes and sparkling diamonds to be displayed to their finest. 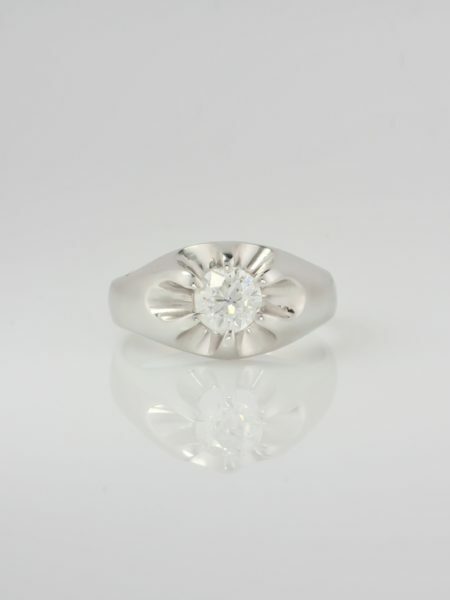 Curves and arches encapsulate the essence the period in a flower form . 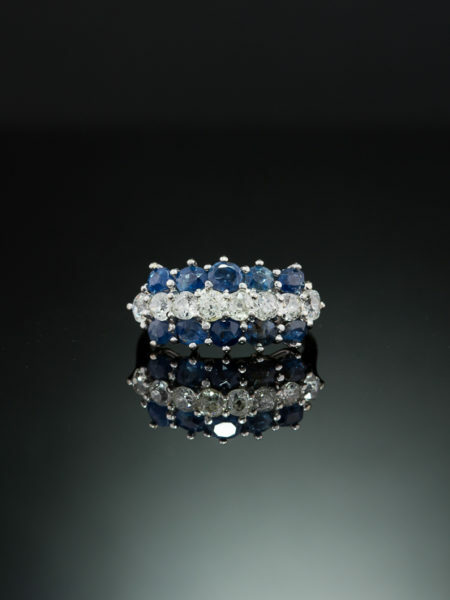 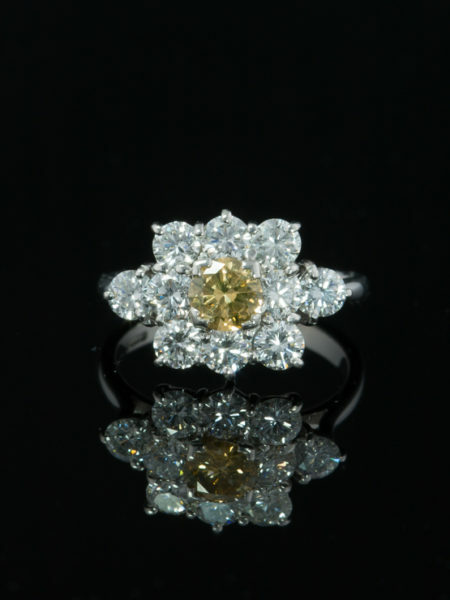 At the center a sparkling old European cut diamond in the guise of a flower but followed by a smaller old European cut diamond in vertical orientation create a soft focal point with approx .60 Ct of pure sparkle (for the couple). 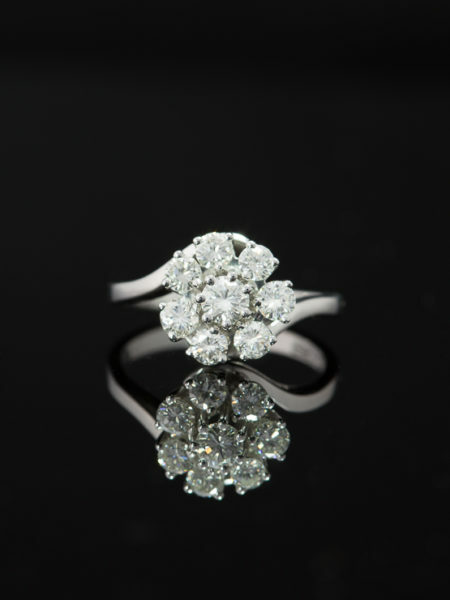 Light and graceful, with sophisticated open work displays fourteen old cut diamonds totaling 1.07 Ct balancing a feminine flower form with sensual design sensibility. 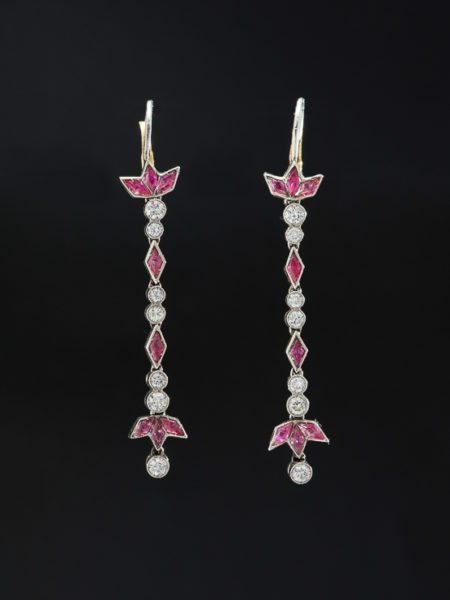 For glimpses of scintillation, seventeen rose cut diamonds add their elegance with approx .37 Ct by spread, completed by its original bale enhanced by twinkling rose cut diamonds. 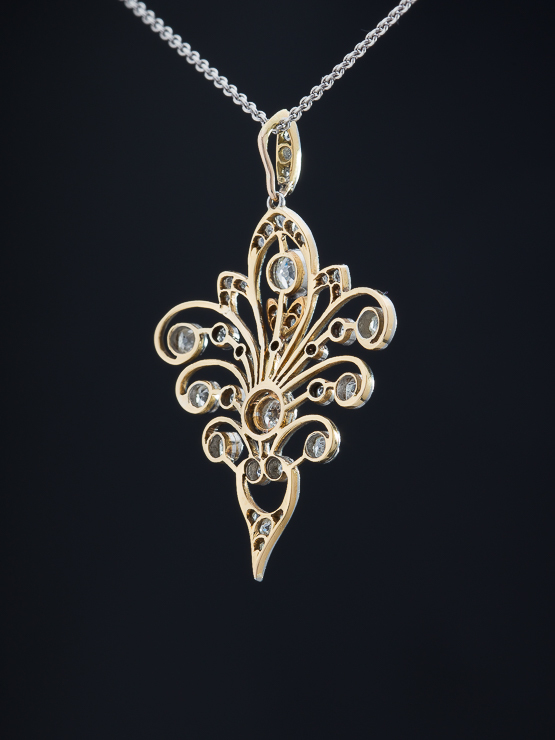 Sensual, pleasing to the senses and wondrous on, it is easy to imagine the creators spending days, weeks in its ultimate realisation. 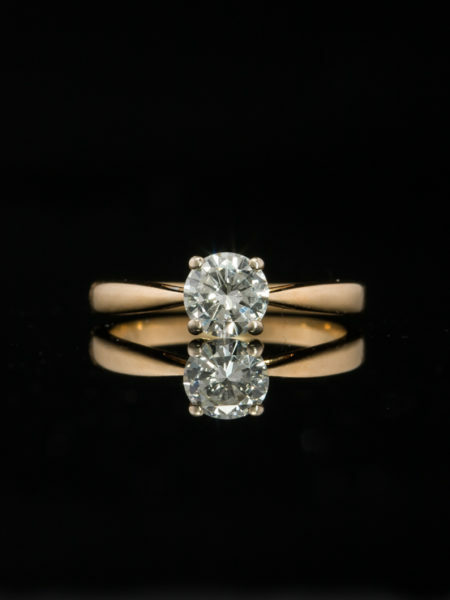 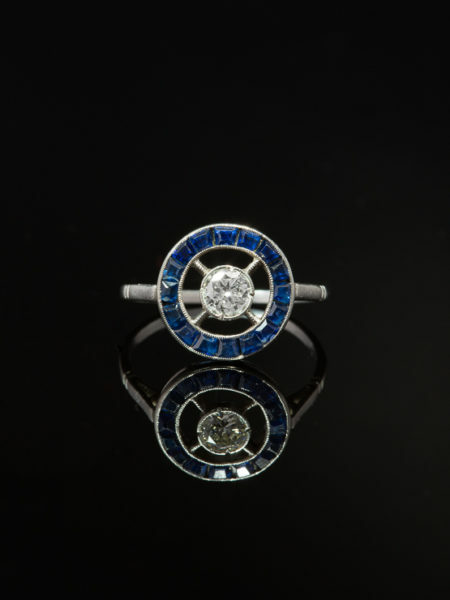 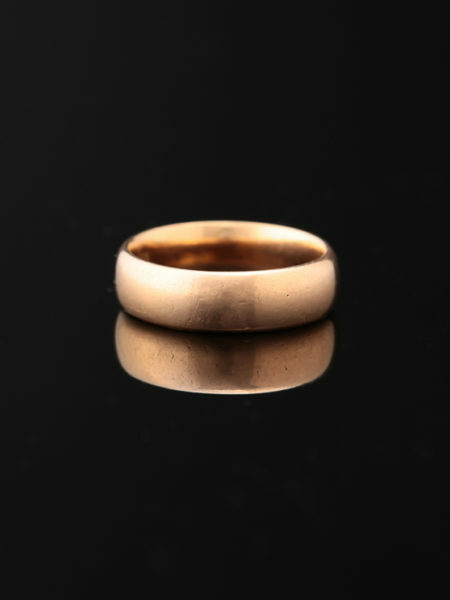 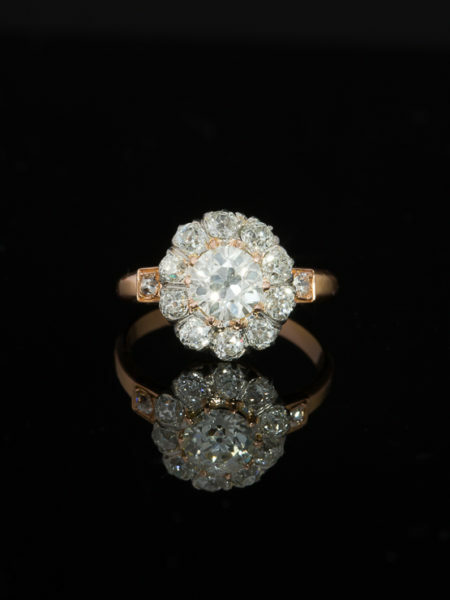 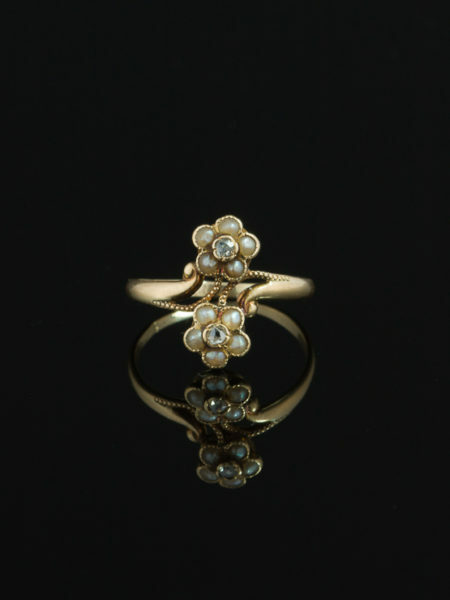 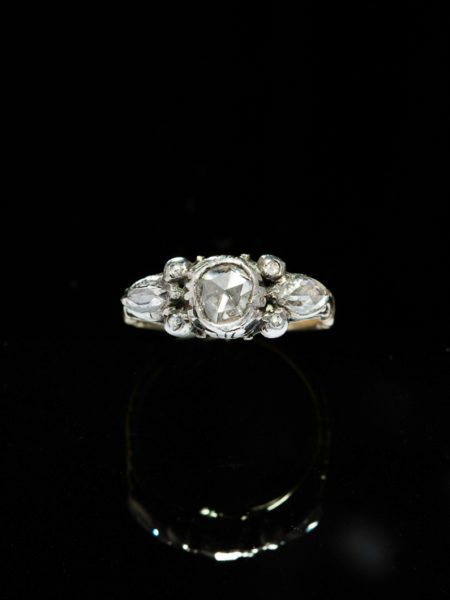 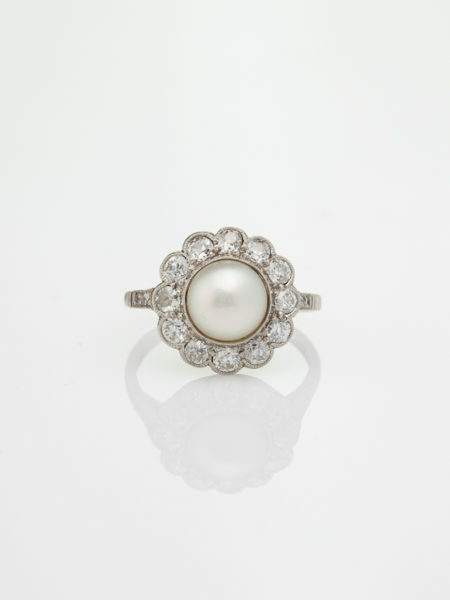 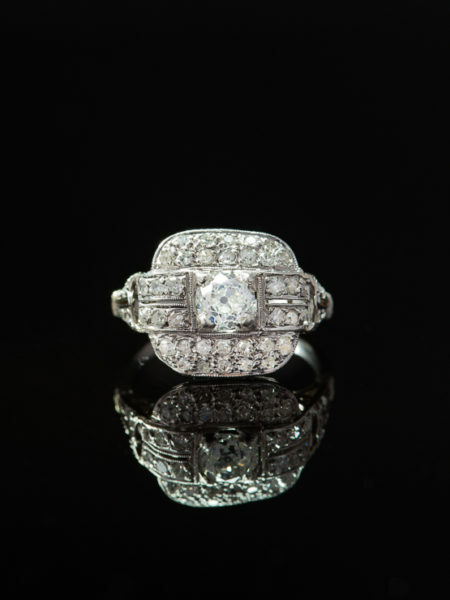 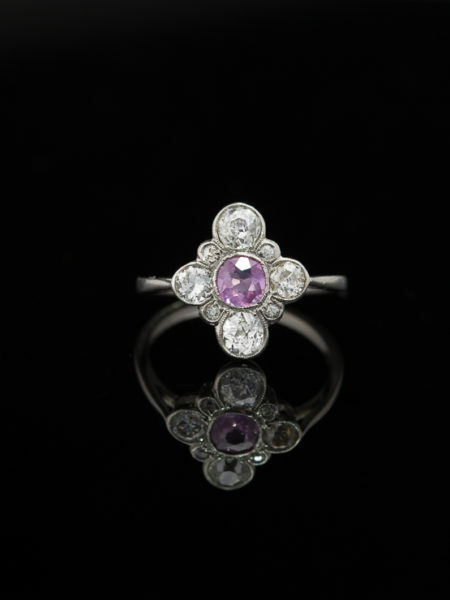 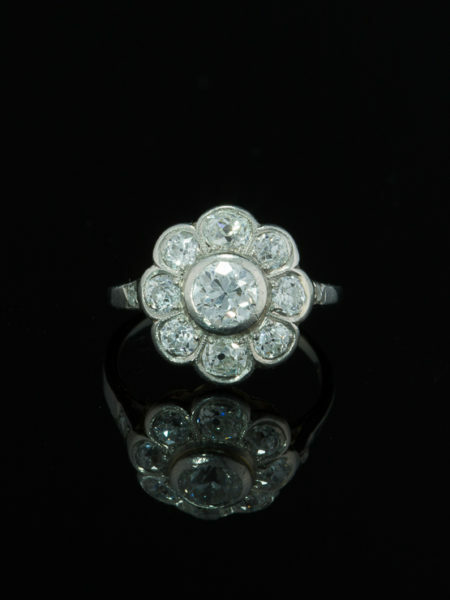 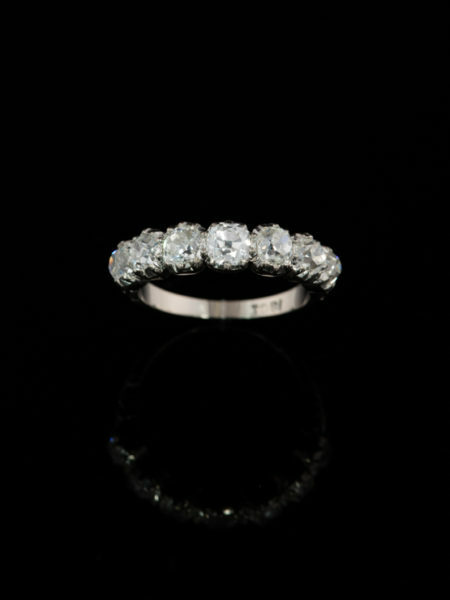 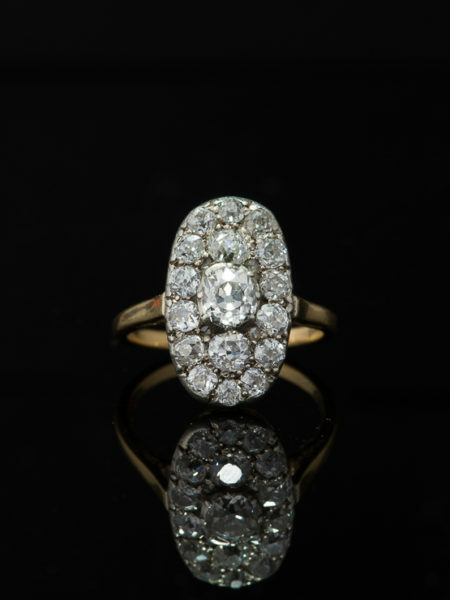 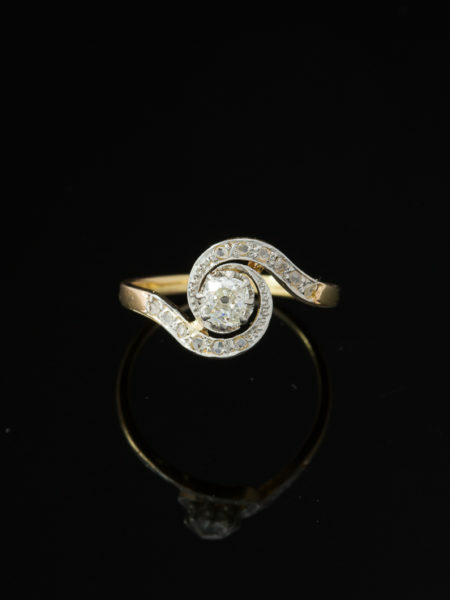 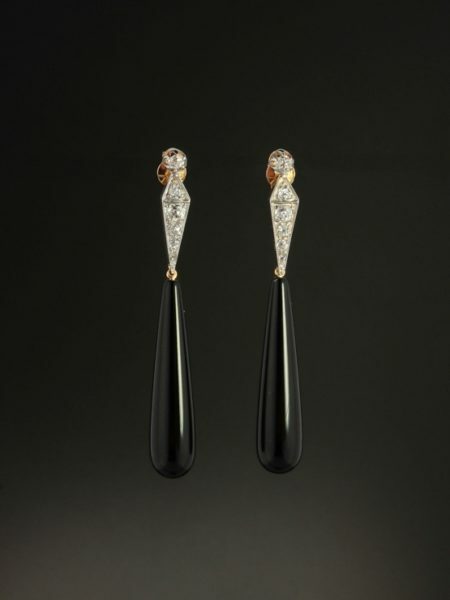 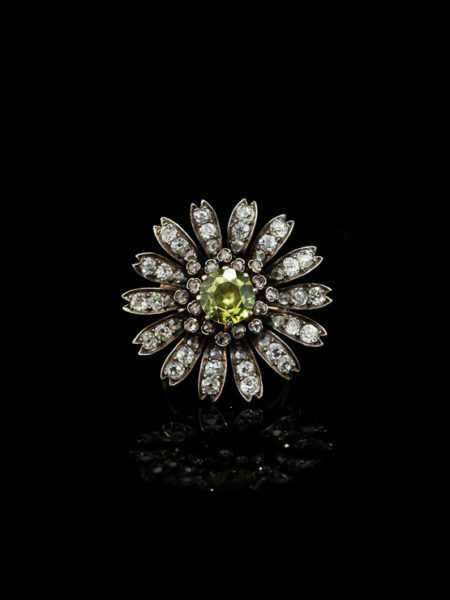 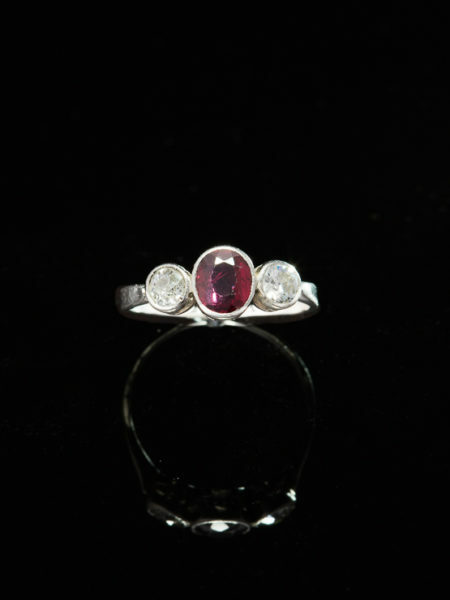 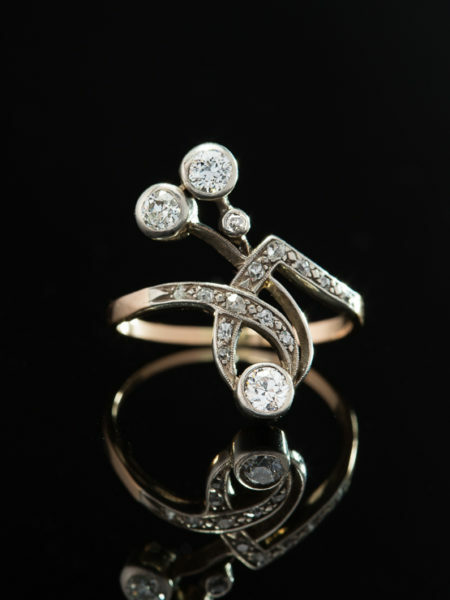 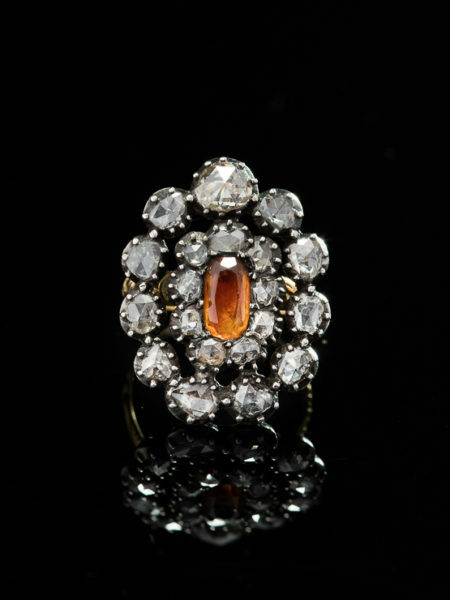 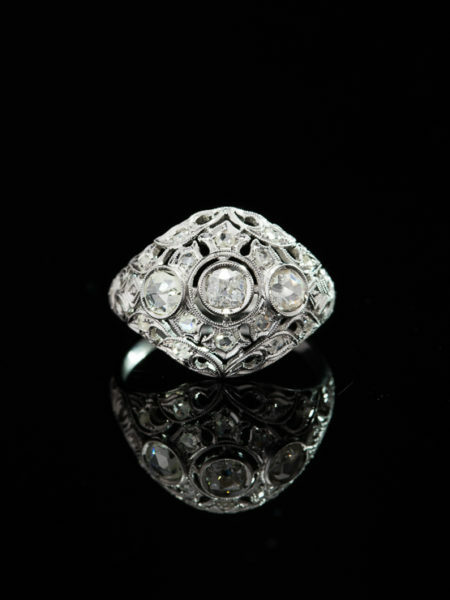 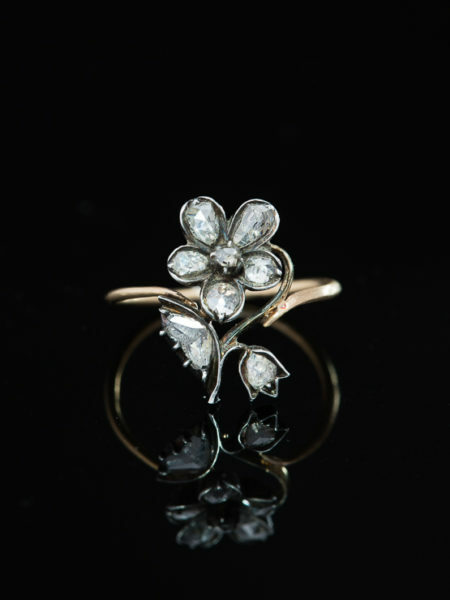 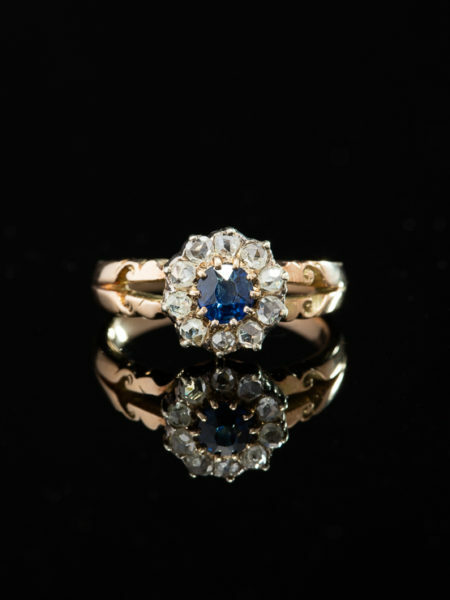 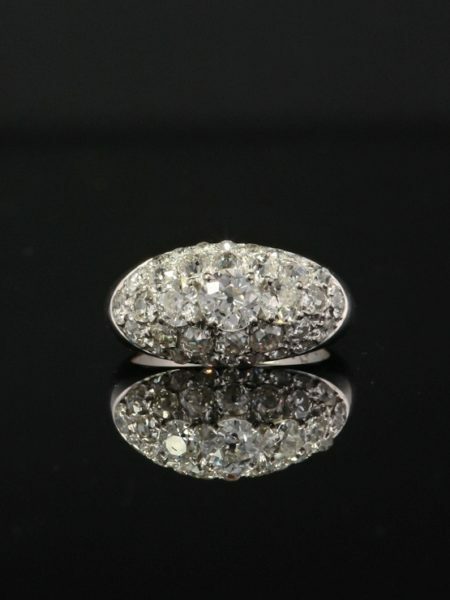 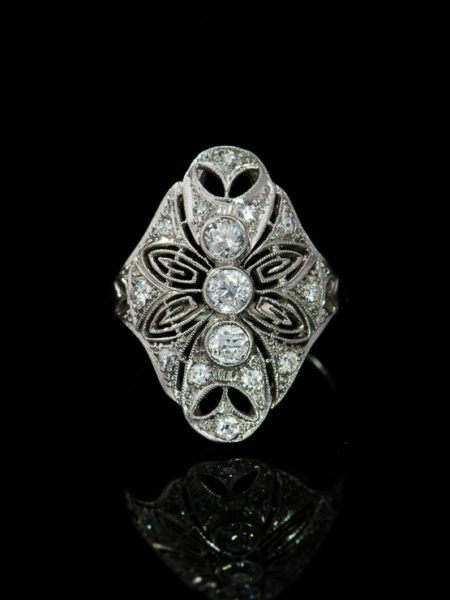 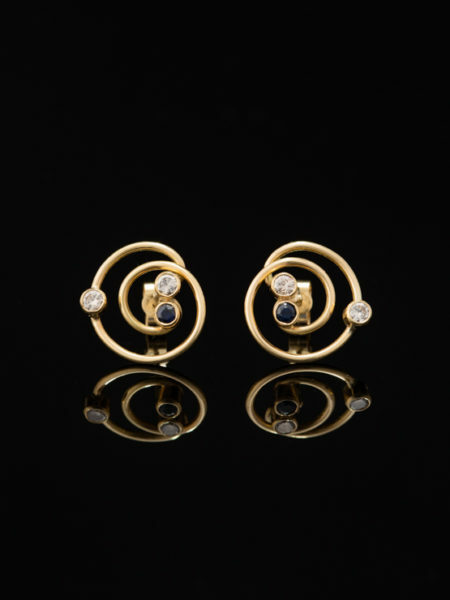 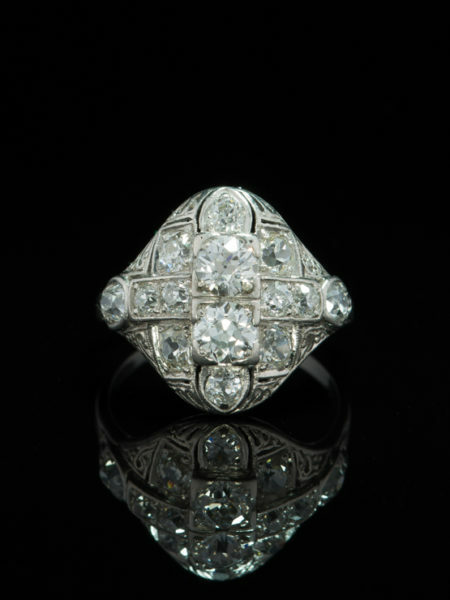 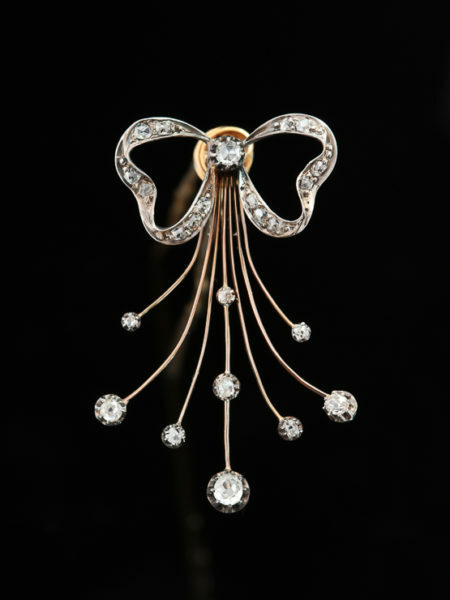 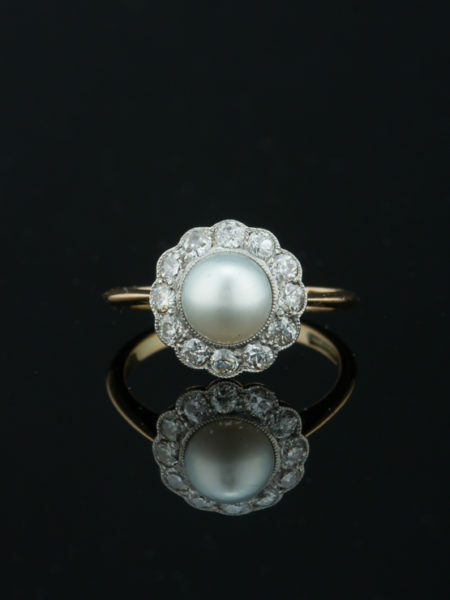 Artfully crafted in 18 Kt yellow gold and platinum top during Edwardian era, tested.